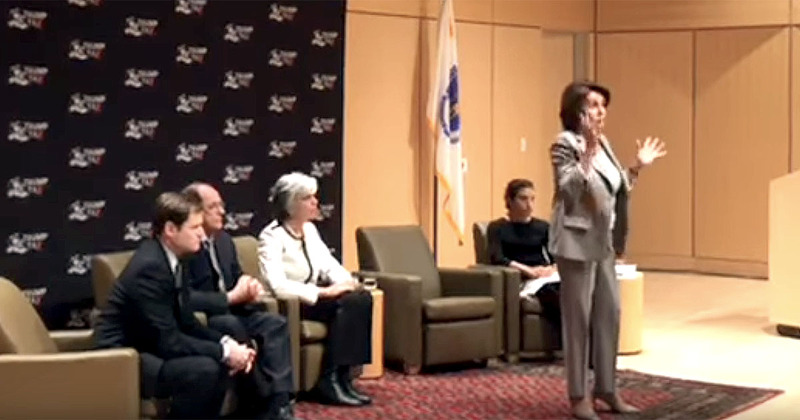 Nancy Pelosi continues to demonstrate how out of touch she is with mainstream America, this time in Massachusetts at what was described as a tax reform town hall. The use of the word reform by the party of wealth confiscation and redistribution may not be accurate, but that’s what they went with despite the target of their wrath, President Trump, being the true reformer of taxation in America. The backdrop is littered with a logo of the banker from the game Monopoly and the words “Trump tax.” It’s more proof, in addition to their remarks and political affiliations, of their commitment to the same old tax and spend “government knows best” madness of Karl Marx. Equality only counts for the peasant class, as Pelosi’s personal tax break and income is certainly not in the crumb category. She’s having difficulty defending those remarks as Americans are now getting larger paychecks and will be keeping more of their money at tax time compared to what we’re used to under the Democrat thieves. Crumbs are not bad if they’re big enough and we have the freedom to spend our own money in the manner we see fit. We like having it in our own wallets, to spend on our own families rather than the illegal alien squatters and loafers she wants to hand out our confiscated income to. She and her ilk see our money as her money, with what she doesn’t funnel into her own pocket being handed out to people we don’t know. Dems are great at giving away our money in the form of cash, housing, tax refunds, food and medical coverage to complete strangers, including those of foreign nations and those unwilling to work for themselves. What is crumbs to the wealthy Pelosi is real money to a lot of Americans and we’re glad to have it, to be able to keep it. Communism and socialism don’t work. She and her comrades are simply upset that the failures of their party and system, as demonstrated over the course of eight years of Obama austerity are being so boldly demonstrated by the America first capitalist, President Trump. The middle class portion of the bill would not be what thought it would be, but the corporate side is great. 15% would have even been better. The GOP watered it down and I wish Trump would have fought for it. When “wealthy corporate side” do well everyone does better. Anything, even the crumbs are better than nothing, and the corrupticians will keep the tax $$ flowing, with the D side wanting no tax cuts. The economy doing so well will has most saying “if he needs to deal on amnesty it’s OK”. If there is 1 illegal given the green light ALL will be allowed by the ciourts, as equal treatment.